Prior to reading Lisa McGirr’s The War on Alcohol, I thought Prohibition was, as the author described popular notions of the era, “an aberrant moment in the nation’s history, wrongheaded social policy waged by puritanical zealots of a bygone Victorian era, with few lasting consequences.” I expected a connection with the War on Drugs; it was noted but not explored in any detail. What surprised me is that the war on alcohol drove millions of voters into the arms of the Democratic Party and gave FDR’s New Deal a populist, revolutionary energy beyond what may have been justified on economics alone. I knew Lincoln was a Republican and wondered how the party lost black voters; now I know. They merged church and state to enforce “good” behavior – a “perfect storm” of ill-conceived public policy that could only lead to punishment of defenseless citizens. The sad part of this experience is that Republicans seem to have few regrets (else we would not have the ATF, DEA, etc.). Apparently, they concluded the mistake was overreaching; outright prohibition created a hugely profitable black market. Today, “sin taxes” regulate the supply of tobacco, alcohol, gambling, and marijuana – splitting profits between government and business. Just finished reading “Citizen Warriors”, ch.5 of The War on Alcohol by Lisa McGirr. Lisa McGirr’s new book, “The War on Alcohol,” an authoritative history of Prohibition and American identity politics of that era, has a lot to say about our current “War on Drugs”. The more-or-less official motto of historians is the famous line from George Santayana: “Those who cannot remember the past are condemned to repeat it.” A codicil to this might be: “Historians who cannot connect the past to the present are condemned to irrelevance.” Far too many histories fail to make clear how their readers could learn from the past, not just to understand it on its own terms, but to avoid repeating its mistakes. Harvard historian Lisa McGirr’s new book, “The War on Alcohol: Prohibition and the Rise of the American State” emphatically connects the past to the present. Many excellent books have delved into this subject, both recently and during Prohibition, especially perhaps Daniel Okrent’s “Last Call: The Rise and Fall of Prohibition” and George Ade’s 1931 polemic, “The Old-Time Saloon” (full disclosure: I am working on a new, annotated, edition of Ade’s book). McGirr’s well-written and accessible volume is essential because she not only recounts familiar aspects of Prohibition with insight and verve — she clearly, cogently and persuasively connects that era’s politics and policies to our contemporary Prohibition: America’s decades-long “War on Drugs.”After recounting the story of the Woman’s Christian Temperance Movement and the Anti-Saloon League’s legislative victory in passing the 18th Amendment, McGirr delves deeply into what today we’d call the “identity politics” of Prohibition. The complexity of this social and political movement is astonishing: Anything that could get Jane Addams and the Ku Klux Klan on the same side of any argument is beyond simple summary. 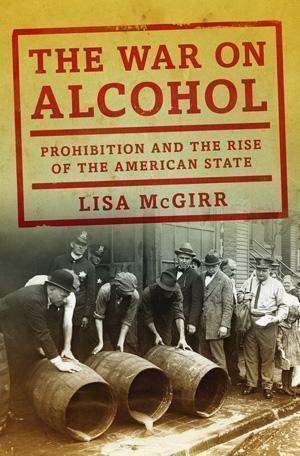 Nonetheless, McGirr is at her best when she delves into the complexities of how different sorts of Americans experienced Prohibition. What it meant to live under the Volstead Act and government enforcement regimes differed based on what sort of American you were, and not just along a Wet-Dry axis. Rich or middle class or working class or poor, urban or small town or rural, white or black or Latino, male or female: Prohibition and its law enforcement effected everyone differently, in ways that had profound and lasting effects on American culture. Local cops were famously corrupted by bootleggers and their vast wealth, but McGirr recalls how Prohibition created a new federal police culture, one that mostly focused its attention on marginalized Americans. While the well-to-do could consume pre-1919 alcohol they had stockpiled or smuggled goods in the privacy of their homes or clubs, the poor in cities had to brew their own or buy ill-made, expensive and often poisonous drink in violent and crime-ridden speakeasies. The law focused its attention, then as now, on the poor who lacked the political clout or financial means to fight back in court. Many working class or immigrant Americans had been relatively apolitical, thinking that voting was unnecessary or irrelevant to their daily lives. Prohibition helped change that. As McGirr points out, “While Prohibition was not necessarily the central concern of working-class men and women, selective enforcement added a significant new assault on their efforts to sustain an independent realm of leisure, culture, and community ritual.” This assault led ethnic immigrant urbanites to see Prohibition not as a moral crusade, one meant to purify and uplift them, but as a discriminatory war against them. 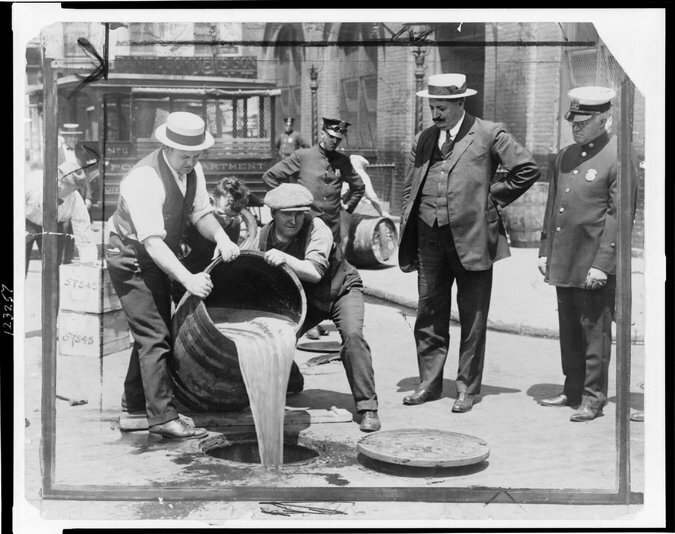 Like everything else in American culture, Prohibition was further complicated by race. Prohibition’s rise, especially its latter years of strict enforcement, helped create the second Ku Klux Klan — who often acted as vigilante supplements to official law enforcement — and helped whitewash the racist violence of so much Southern culture. As McGirr puts it: “In an era when its ‘best’ men and women kept silent about the public murder of African-Americans through lynching, Prohibition promised to burnish the moral authority of southern elites, realigning the ‘moral and patriotic elements of Southern society on the side of the law. '” Then as now, under mandatory sentencing laws, poor black people went to jail for longer terms than whites, for committing even minor crimes. Yet even this seemingly clear-cut example of the racism of Prohibition enforcement has deeper complications based on class, the axis of identity American culture most likes to pretend doesn’t exist. McGirr writes that “one of the novel aspects of the Eighteenth Amendment was the extent to which poor whites — carpenters, farmers, and other small-time moonshiners — were targets of southern law enforcement alongside African-Americans.” So, while many whites — rich or poor — might have been fine with enforcing Prohibition on black moonshiners and speakeasy operators, the fervor for “enforcement” swept up poor whites as well as poor blacks, giving them common cause. Here is where McGirr’s book pivots from being a very good, tightly focused, history of Prohibition to a great history of broader American politics, one that connects to contemporary issues in a profound way. Prohibition was not just an aberrant period, something to be bracketed off from the Gilded Age before it and the Depression and World War II after. McGirr persuasively argues that President Herbert Hoover and the Republican overreach on enforcing a deeply despised law changed American politics more than most historians have understood (or admitted). Under the flag of repeal, African-Americans and white city dwellers flocked to the Democrats. McGirr writes: “Prohibition opposition became the cudgel that broke apart earlier loyalties and forged new ones.” The seismic shift of African-Americans abandoning the party of Lincoln, the Great Emancipator, cannot be overstated. For various urban white ethnic immigrants to see past their divisions and agree that the Democrats’ stance on repeal mattered more than anything else was also earth-shaking. This change did not happen overnight: Anti-Catholic prejudice prevented 1928 Democratic Presidential candidate Al Smith for capitalizing on such a coalition sooner. But the subsequent four years of draconian federal encroachment on everyday life — and vigorous political organization and get-out-the-vote drives by Democrats — enabled Franklin Delano Roosevelt to lead the way to the New Deal by campaigning for repeal. So, Prohibition caused a fundamental political re-orientation, one that enabled the Democratic Party to occupy the White House for 20 years, and to change the very idea of what the federal government should, or could, do about nationwide social issues. The New Deal (and the Great Society) government programs happened only because of the political realignment born of Prohibition and the very idea that the federal government should address social issues at all. To cite yet another maxim about history, William Faulkner’s: “The past is never dead. It isn’t even past.” McGirr eloquently demonstrates that while national Prohibition of alcohol died in 1933, it is not past; we are repeating its mistakes eight decades later. The contemporary American and international prohibition on drugs parallels the violent crime, extreme law enforcement and vast prisons born out of Prohibition. McGirr reminds her readers that “The war on alcohol was brought to an end by a powerful combination of mass hostility to the law, elite opinion makers who dared challenge the consensus, and politicians who saw repeal as the road to the White House and even party realignment.” Perhaps books like McGirr’s will teach Americans to repeat the liberating logic of repeal. Bill Savage teaches Chicago literature at Northwestern University. The imagery in Chapter 8 titled “Repeal” in Lisa McGuirr’s The War on Alcohol evokes strong emotions primarily because it paints a picture so relevant to today. It would be baffling – if it didn’t sound so familiar – to think that in 1932 “at the height of global economic catastrophe,” there had been so little focus and concern put on how to solve the bank failures, the unemployment crisis, the breadlines, or the rise of fascism in Europe; and that the platform plank pledging repeal of Prohibition stood out as the vital issue of the election that brought the hall at the Democratic National Convention to erupt in sustained applause. Of course, by 1932, repeal seemed like a natural culmination of a long fought battle that had brought devastation around the country . . . with the lethal alcohol alternatives found on the black market, the graft and corruption of public officials connected to organized crime, the selective enforcement that severely affected the poor and minority working class populations, the out of control citizen prohibition militias, not to mention the ballooning power of the federal government, subject to abuses. The reaction favoring repeal in 1932 wasn’t the problem – the problem was America’s response to the “moral crusades” of the early 1900s that brought about Prohibition in the first place. Even though the heavy use of alcohol had certainly created some worries for the nation, and it had some devastating effects on women and children, careful thought should have gone into the least harmful and intrusive approaches to addressing those concerns, without calling out the full, uneven enforcement powers of the federal government with an outright ban encouraging a black market and subsequent consequences. The book’s obvious relevance lies in our current War on Drugs. How did we repeal Prohibition, but not learn some of the deeper lessons that have had devastating effects on our Borders, our inner cities, our overcrowded prisons, and even our health and well being? Now that states are starting to make marijuana — especially medical marijuana — legal, and some presidential candidates have adopted a national legalization position, we can see that change is around the corner. One of the very few current issues receiving bi-partisan support is criminal justice reform. But will we get it right? Will we simply pass legalization/non-criminalization/rehabilitation measures without re-tracing our steps of how we got here and what else has been negatively affected that needs reform? Will we re-evaluate the power we’ve given to the federal government? The War on Alcohol is relevant even beyond the War on Drugs. With FEAR as a driving force, we’ve seen similar patterns play out over abortion, gay marriage, immigration, gun control and the list goes on. The devastating effects of illegal back-alley abortions and intrusions into privacy brought us a more activist Supreme Court (Planned Parenthood v. Casey). More recently, we watched the religious right’s heavy influence sway state after state to pass constitutional amendments banning gay marriage as part of election mobilization efforts to help get Republicans elected. As public sentiment began to shift in favor of gay marriage, Republicans dug in their heels, advocating for a national constitutional amendment. Now with the Supreme Court’s recent ruling finding an equal protection right for gay marriage, Republicans have grown relatively quiet on an issue that has dominated their politics for the last several election cycles. Not only is this similar to Herbert Hoover’s approach with the Republican Party in 1932, as he dug in his heels on Prohibition rather than listening to the Rockefeller wing of the Republican Party, but we see a similar thing playing out over immigration. After the 2012 election, it seemed clear that Republicans needed to improve their position on immigration in order to attract more minorities into the party and forge the kinds of coalitions needed to take back the White House. But in the 2016 election cycle, candidates such as Jeb Bush and Marco Rubio felt forced to tone down their comprehensive reform positions, but still lost to candidates such as Donald Trump and Ted Cruz, the most ardent anti-immigration, anti-comprehensive reform candidates. It’s hard to tell at this point if this strident approach will lead to the Republicans’ loss in 2016, or if enough pent up anger by the white working classes will carry them through. But either way, the lopsided emphasis on enforcement, without addressing the underlying issues, and the expectation for the federal government to wield its heavy hand against the “threatening, less powerful segments of our society” will in many respects prove fatal at some point. Gun control – primarily on the Democratic side – is another issue where we have a president issuing executive orders in response to various mass shootings that are mobilizing citizens, especially women, to call for action. We need to proceed intelligently and cautiously as we work to address the problem, and not hand over too much power to the federal government. We’re now starting to witness new political re-alignments in the country, in part due to the unintended ramifications of our policies, which have ceded power away from the people. It’s up to us to help steer this energy in a productive direction. As we work to do so, I’ve been reminded, through reading the book, that all of our problems and challenges run deeper than can be found in policies that are largely political in nature. Those who have the biggest impact for change, such as Al Smith who favored repeal before FDR did, are often largely forgotten. I’m glad to be part of this movement, which isn’t an “ends justifies the means” movement, but is more about the methods, the developing culture, and the ability to truly empower people. Understanding as much history as possible, from various perspectives, and getting fully educated about current events and the latest research will help us proceed less reactively and more purposefully, thoughtfully and inclusively towards long term change for the better. Lisa McGirr’s ‘The War on Alcohol’ is the kind of book that stays with its reader. I think this is especially true for a sensitive, long-time political and community activist like me who has spent decades anxiously hoping for and working toward the time when our world, simultaneously beautiful and cruel, will change. Although I often experience the writings of historians as entirely too preachy and wordy, I found myself wanting to read every word of Ms. McGirr’s book. In the book’s chapter ‘Selective Enforcement’ I was impressed by the author’s courage in exploring the un-equal treatment of wealthy (mostly white) Americans vs. poor white and poor black people. Although black people in America have a particular and brutal history, I have never believed that the color of one’s skin is the only indicator of one’s suffering. No heat and no food in the refrigerator equals cold, sleepless nights and empty stomachs whether the person has blue eyes and blond hair or dark hair and brown or black skin. Poverty and race in America far too often equals a life of everyday experiences that are harsh and unfair. To add insult to injury, the message is always clear that these experiences should be shouldered alone. If I had a dollar for the number of times that my middle-class, white peers have told me that they don’t want to hear about my everyday experiences, or insinuated that I was to blame for those experiences, I would be a millionaire. 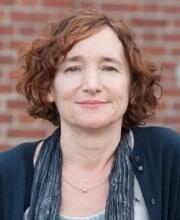 Lisa McGirr did a wonderful job of opening my eyes to the short but deeply impactful Prohibition Era in America. Prior to reading “The War on Alcohol” my knowledge of this piece of American history was nearly non-existent. I vaguely remember a scene or two in movies where smiling, imperially slim, white men and women danced their hearts out at glamorous parties during the fun, ‘Roaring Twenties.’ Meanwhile, in back alleys ‘shady’ characters exchanged money for boxes of liquor. I think Brad Pitt had blown dried, blond hair in one of these scenes! In her chapter “Selective Enforcement” the ‘movie’ scenes that the author created were far from glamorous. In painstaking detail, Ms. McGirr told the history of the enforcement of Prohibition. I found myself needing to take breaks from reading the vicious details of the uneven ways that Prohibition was enforced: white, wealthy and able to pay off enforcement agents equaled little to no penalty; poor white, black, female or Mexican equaled fines, imprisonment and sometime death for possessing even the tiniest quantities of liquor. Although I wasn’t surprised, I was struck by how history repeats itself over and over again. I found myself cringing when I read about Bradley Bowling, a poor, white, unarmed man in an Appalachian town, who was shot and killed by a Federal agent over a half gallon of whiskey, because he ‘put his hand in his pocket.’ While I read this, the faces of unarmed black men and women who have been shot by the police moved through my mind. Ms. McGirr posits that whites’ experience of unfair and unlawful over-reaches by police during the prohibition era helps to explain why there was strong and popular push back against Prohibition. As per Ms. McGirr, black people had YEARS of experience of abuse and coercion by police and other agents but this treatment was largely ignored as were the public lynchings of black men and women. The white pushback against the abuses of prohibition agents reminds me of America 2016. News channels are filled with pundits nearly scratching their heads as they try to explain the tidal wave of white, working class voters who are clearly angry and fed up with the corrupt political system and its impact on their pursuit of the American Dream. Real talk, the American Dream died a long time ago. Black people have been aware of this fact due to double digit unemployment, brutal and dismissive treatment by the police and shabby treatment by healthcare professionals. I have no doubt in my mind that poor white people have had and continue to have similar experiences, but sadly seem to be holding out hope that their white skin will come through for them. They could learn a lot from Lisa McGirr. Michelle McCleary is a long-time independent political activist and the President of the Metro NY Chapter of the National Black MBA Association. When I first heard of Lisa McGirr’s book ‘The War On Alcohol’ I assumed it would be a condemnation of the evils of drink and how to live a purer life of total abstinence. Oh how wrong I was! This book is about the rise of unfettered federal power without an understanding by individual citizens. My information about Prohibition comes from memories told to me by my parents and the movies. My memories are of the later prohibition of Mary Jane in the 70’s. Both sets of memories can be looked upon as a funny and amusing experience. Fortunately, none of us were ever caught or incarcerated. I started reading the book by reading the chapter on the rise of the Penal State and then read the rest of the book. The penal state comes to prominence under Herbert Hoover and is refined by J. Edgar Hoover’s FBI. H. Hoover wanted a total reform of the American justice system by increasing the power of the federal government and announced his intentions in his inauguration. Thus, the control and prevention of crime became a national issue for the first time. Many surveys were carried out and acted upon both by Congress and by executive commissions and orders. Well-meaning ideas concerning treatment of working class blacks and whites and immigrants were enacted often without consultation with the recipients. ‘We know what’s best for you.’ Incarceration of minorities and underprivileged persons became the norm. More prisons needed to be built and more officers were needed for enforcement. The Federal system was needed to coordinate, collect and control the rise of crime. Once the system was up and running it was easily changed to concentrate on narcotics when the prohibition of alcohol was repealed. Unfortunately, the idea of totally prohibiting addiction rather than medically treating the problem continues. This seems to be an American attitude compared to what occurs in Europe and Scandanavia where a system of treatment and maintenance for the individual exists. It is also the story of what happens when a good intention goes wrong. Carl Farmer is a designer and political activist now living in Rhode Island. Side Note: Here is an interesting 2008 NY Daily News article about RI’s most infamous “rum runner”, Danny Walsh. It is one example of how Prohibition contributed to the expansion of organized crime. On November 9th, 2015, WBUR’s Radio Boston host Meghna Chakrabarti interviewed Lisa McGirr on The War On Alcohol: Prohibition and the Rise of the American State. I think you will really enjoy listening to the show. Here are some of my favorite moments in their conversation. They discussed how the FBI expanded its activities during Prohibition. A version of this article appears in print on December 31, 2015, on page C4 of the New York edition with the headline: Throwing a Cold Splash on Prohibition Nostalgia.